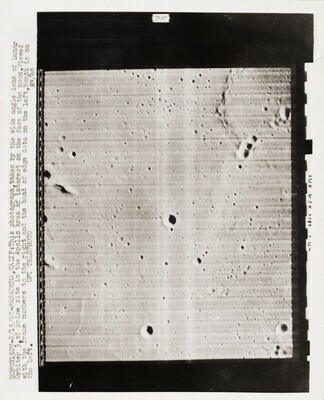 across top printed in negative: HCP021507-2/15/67- PASADENA, CALIF: This photograph, taken by the wide angle lens of Lunar / Orbiter 3 of prime site in the Apollo area of interest on the face of the moon. Viewed / with the frame numbers to the right and the band of edge data on the left. North is on the left. UPI TELEPHOTO; on verso, upper left printed in black ink on applied barcode label perpendicular: historicalimages.com / nera00450; lower left stamped in red ink perpendicular: CLEVELAND PRESS / FEB 17 / 1967 / REFERENCE DEPT. ; by unknown hand, lower center in black ink perpendicular: D12938 moon; lower right stamped in purple ink: PLEASE CREDIT / United Press International Photo / This picture is for your publication only and must / not be loaned, syndicated or used for advertising / purposes without written permission from United Press / International. By accepting this picture you agree to hold / United Press International harmless from any loss or / damage arising by reason of your use or publication / of this picture. / UNITED PRESS INTERNATIONAL, INC. / 220 EAST 42nd STREET / NEW YORK 17. N.Y.
Mary and Dan Solomon, Monarch Beach, CA; gift to NGA, 2018.